I waited for decades for this to happen. The Sci-Fi movies all promised this for a long time. It finally came to a point where it gets serious. It's not perfect by now, but it's a good start. There is nothing here that wasn't around for decades. Computer geeks used their computers via relais to turn thing on or off for fun. But the thing that really drove smart home forward was the appearance of the Assistants. Alexa, Google Home and even the Google Assistant on your phone are the key to success. That's because it's not pratical to go to your computer and give the command to turn on the lights. Why don't you walk to your wall switch in the first place? But if you sit on your couch and it's getting dark and you can just say "Hey Google, turn on the lights", and the lights are shining in a second, that's where you never want to go back. However it is not cheap to automate your home. A set of 3 light bulbs with bridge costs you about 200 Bucks. Sure you have a lot of extras like colors and dimming, but still. Not better with power switches. Adapters that sit between the device and your wall power outlet. But about 30 Bucks per device is some serious drawback. Here is where the Sonoff switch comes into place. The basic model is around $5-8 Dollar. Now we're talking. With that money, everything can be switched with Alexa or Google Home, and your smartphone. Even from underway! The processing is decent, and if you know what you're doing, it's a quite safe thing. New badges of these comes wit many standard certificates like ROHS and CE. The basic models can handle 10A (2200 Watt), which is good enough for most things. Check your device before using it with this switch. There is a PWR model that handels 16A which is for all common electric devices that plugs into your wall outlet. You are one of those person that really fears to left the heater running or the oven on when you left? Just take a look. You not only you can see if the device is on, but you can switch it from anywhere. I use a switch to turn on my sound receiver and the connected Chromecast Audio. I don't have to stand up to turn both things off, but save energy by not letting them run 24/7. I put this in a little certified box (very cheap at your local tool store) and attached a 3 plug outlet to it for switching more devices in the future. 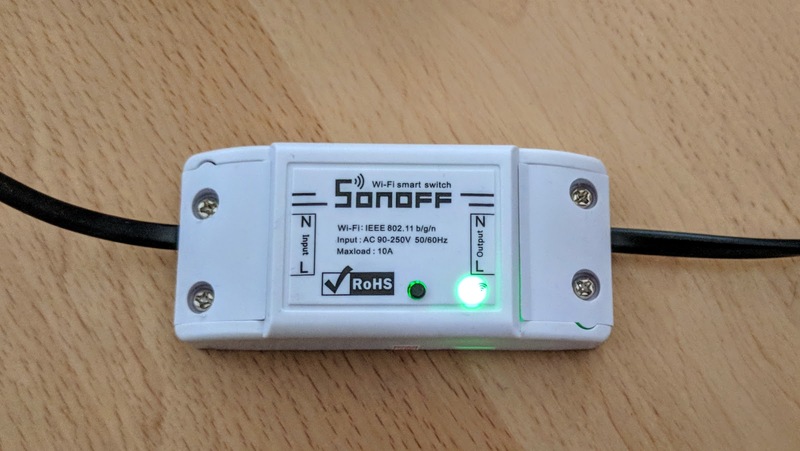 You need to keep in mind that the ground wire needs to be connected directly, since there is no ground through in the Sonoff switch. 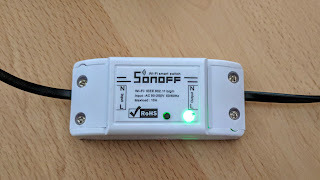 There are more Sonoff models. Not only for 16A instead of 10A, but with a monitor to see how many energy you consume. Or with a thermostat or humidity control. So basically you can set a heater to only run when the temperate falls below a specific temperature. So you can safe money, but won't let the house go completely cold when underway. But there is more, much more, to be solved. Turning on and off is great, and many things can be done. But some devices need a deeper integration, and those often big companies are too slow. The washing machine is a bad example. Smart washing machines are way too expensive and have a bad integration. I want to control and get status via my Google Home or Alexa device. Basta. These things would cost approx. 50 bucks or less (basically they could do this with a small wifi module and a Raspberry Pi). But well-known companies charging hundreds and hundreds of dollar on top of the, already very expensive, prices. Some other stuff needs better integration, too. Basically everything that needs an action after you turn it on needs more than a simple on/off switch. Sure, I can switch on my Nespresso machine. But I need to press a button after connecting the power and another to start dripping the coffee. Yes, Nespresso e.g. has a connected machine. But only via Bluetooth and only connected to the app. Bummer. 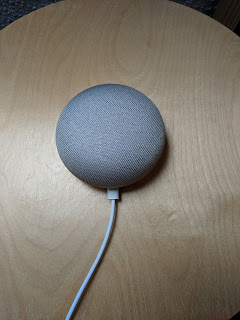 No Google Home connection again. Maybe I'll switch to a good old coffee brewer because of that. Just power and the coffee starts to come out. More examples: VCR/PVR devices to record stuff. Playback is great via Google Chromecast: "Hey Google, play Stranger Things on Netflix" but no recording of a simple TV cast. Door locks also need better integration. Same with window shutters. But the start is awesome since the voice controlled assistants are available. I'm looking forward to see more things to come, and more possibilities to make Eureka look like a nostalgic romance.